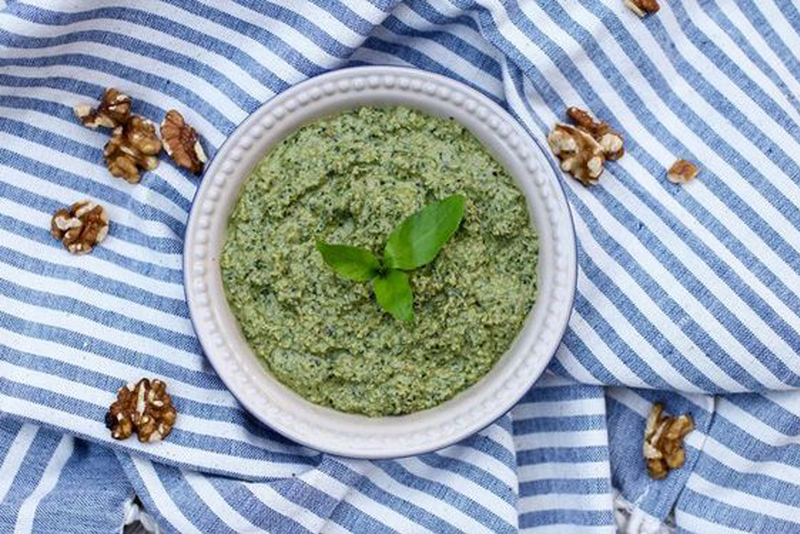 Pesto has long been one of my favorite sauces. As a kid, my Mom made pesto for my brother and I fairly often, and those pesto pasta nights were always pretty special. Not ashamed to say that my Mom’s pesto is still the best out there. However, after cutting processed carbohydrates out of my diet about 5-6 years ago, my pesto consumption became almost nonexistent. Mostly because I was totally naive to how many dishes work well with pesto that don’t involve pasta of any kind. Roasted veggies, salads, meat, fish, sandwiches (lettuce wrapped of course)… there were so many ways I could have used pesto, but I just wasn’t thinking. Thankfully, at some point over the past year or so I brought pesto back into my life in a big way. 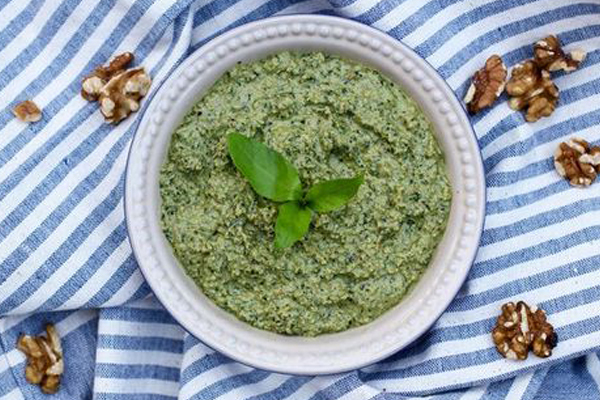 At first, I was buying store-bought pesto until I realized how silly that was. First of all, can you say overpriced? 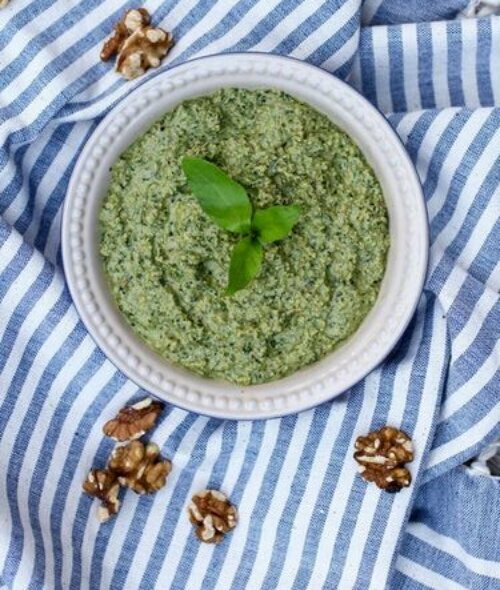 Second of all, pesto is SO easy to make and has so few ingredients that it really makes no sense not to make it at home. Really, the only downside to making pesto at home (or buying it) are those exceptionally pricey pine nuts. A tiny little container is easily $10 or more. Not terrible if you’re only making pesto once in a while, but for a pesto fiend like me, it’s not the most sustainable purchase. Why so expensive? Pine nut harvesting actually has quite an interesting but unsustainable past which you can read about here. As an alternative, I’ve found that using walnuts instead of pine nuts works almost just as well. I normally have far more walnuts laying around the house than pine nuts anyway, making this recipe pretty simple to shop for. Normally all I have to buy is the basil! 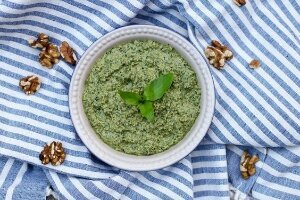 In terms of cheese, pesto is traditionally made with parmesan. Don’t get me wrong, parm is spectacular, but as I’ve written about before, I stopped eating dairy about 4 months ago. The rich and nutty flavors of olive oil, basil, nuts and lemon juice really do stand on their own, even without the cheese. However, if you’re good with dairy, feel free to add in some parmesan. Alternatively, nutritional yeast is also a great option if you want to stay away from dairy but still include something with a cheese-like flavor. I do encourage you to try pesto without cheese though, you might be pleasantly surprised at how delicious it can be! The other important thing to note about pesto is that the kind of olive oil you use makes a huge difference. Opt for something high-quality like Kasandrinos. If you don’t, it could make your pesto bitter and sometimes, inedible. I like to make lots of pesto at once and then use it for a variety of dishes throughout the week. But, if you only want a little bit, feel free to cut this recipe in half. If making a smaller batch, it might make sense to use a small food processor instead of a large one. Toast walnuts in a pan over medium heat for about 3-5 minutes, watching carefully and stirring to ensure they don't burn. Place all ingredients except olive oil in large food processor and process until well combined. It may be necessary to scrape the edges as you go to ensure proper blending. While you are processing, slowly pour the olive oil into the feed tube as you go. I thought pesto was mostly dairy free. What’s the difference between using walnuts versus pinenuts? Hi there, most pesto has parmesan cheese. I discuss a few ways the nuts are different in the post!